The Museum of London Archaeology Service was funded for a period of six weeks during the summer of 1992 to undertake an archaeological excavation on the site now occupied by Shaftesbury Housing Association. The site was investigated because it lay within the precinct walls of Merton Priory and was on the site of part of Morris and Co’s works. The earliest features uncovered on the site were a ditch and a pit dating to the medieval period. Pottery recovered from the ditch dates the features to around the 13th-14th centuries and represents activity within Merton Priory. When the priory church was demolished in 1538 much of the stonework was used in the construction of Nonsuch Palace in nearby Ewell. Some of the stone, however, was used in the construction of local buildings and was revealed in the foundation walls of two 16th-century buildings on the south side of Merton High Street. The western of the two buildings contained a number of ornately carved Reigate stone blocks. The building measured around 10 metres in length by 5.20m wide. Adjoining the eastern wall was a stone-built fireplace. Within the building was a brick and tile cellar floor. The earliest surviving floor dates to the early 17th century and was constructed mainly of brick with areas of plain glazed floor tiles and stone slabs. A ceramic drain was incorporated into the floor and ran downwards to the north. During the 18th century extensive alterations were undertaken probably when the calico works were established. The building was enlarged by the addition of a brick extension built on to the eastern end, adding a further 5.60m to its length. Three brick pier bases were placed within the cellar probably for structural support. A raised floor constructed from re-used floor tiles was added to the south-eastern corner of the cellar. During the late 19th century the building was used by Morris & Co. as a dormitory for the apprentice boys. The building survived until 1940 when it was destroyed by bombing. The second stone building, also constructed of Reigate stone, was located in the eastern part of the site. It measured 10.10m in length by 5.50m wide. The western wall contained a stone fireplace with a later 18th-century version inserted. Between the two stone buildings were a number of brick foundations of buildings associated with the calico-printing works established in the mid-18th century. The walls of one of these buildings contained a re-used Reigate stone slab inscribed with a circle and a simple incised cross on one of its faces, with possible Roman numerals engraved below it. This stone may represent a re-used grave marker for a poor person or canon from Merton Priory. To the south was a north-south channel. Set within it was a row of three oak timber structures dating to around the 16th/17th century. They consisted of a base plate, an eastern upright and a cross brace. Their function is unknown, although they may represent foundation posts of a timber building, again possibly associated with the Amery Mills. The two buildings were used by Morris & Co. as a design and drawing room and an office and caretaker’s house. To the east of them was a brick drain with an arched roof and a timber-planked base. The planks were mainly pine, occasionally oak, and may have been re-used from an earlier timber building on site. A rectangular brick-lined cesspit lay to the west of the brick drain. It measured 3.00m by 1.90m with a depth of 1.30m. It was filled with an organic deposit in which were a number of finds dating to the early 18th century. At the middle of the site was a linear channel dating to the mid-18th century. It ran from north to south and was 3.00m deep. It is likely that it was associated with the bleaching of calico cloth. The channel would have originally joined the River Wandle, and the organic peaty fill shows it to have been waterlogged. A number of artefacts which were probably used in the calico-printing industry were recovered from the channel. 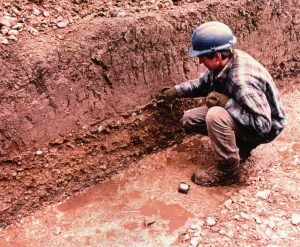 During October 1997 the Museum of London Archaeology Service was funded by J Sainsbury Developments Ltd to carry out an archaeological investigation in Colliers Wood, on land on either side of Priory Road and bordered by the High Street and Christchurch Road. The investigation made an exciting discovery, in the form of the Roman road “Stane Street”. Stane Street was the main Roman thoroughfare from London to Chichester and followed the present A24 from London Bridge through Clapham, Tooting and on to Colliers Wood. Between Colliers Wood and Morden Hall Park the line of the road had disappeared, although further south it is picked up again and can be followed to Ewell and onwards to Chichester. Two trenches dug during the investigation revealed the road running across the north-western part of the site, towards the present Savacentre building and under Merantun Way. It is likely that the road passed just to the north of the medieval Merton Priory, thereafter continuing in a straight line though the middle of the Abbey Mills, across the River Wandle and on to Morden. The road was about 8m to 9m (26 to 30ft) wide and was constructed from both local and imported material such as flint, gravel and sand. The southernmost roadside ditch was found and contained 1st to 3rd century pottery. The road itself was flat with slightly raised banks along either side leading to the roadside ditches. This is unusual, in that generally Roman roads are cambered or have an agger to allow for drainage. However, the type of construction found at Colliers Wood seems plausible when crossing a low-lying area close to rivers such as the Pickle and Wandle. The raised banks could have acted as water defences within the marshland environment, and the road itself may actually have formed a causeway across the low ground. An archaeological excavation was carried out by the Museum of London Archaeology Service (MoLAS) on the site at Furniture Land, Merton High Street, SW19. This archaeological work was commissioned by GreenAcre South-east and was undertaken following the positive results of an archaeological evaluation on the site. The excavation phase of work comprised two trenches (numbered 7 and 8), one located within the north-eastern area; the second smaller trench located further south. The site lies within the northern part of the precinct of the Augustinian Merton Priory (1117-1538). This work was carried out in order to explain the nature, extent and date of a roof tile kiln revealed within evaluation trench 2 and to reveal the full extent of the ‘Gate House’ (shown by cartographic evidence). The earliest feature encountered during the excavation was a re-cut east-west aligned ditch which ran along the southern area of trench 7. This ditch may date to the medieval period and the only finds consisted of occasional pieces of residual prehistoric fire-cracked flint and ceramic building material. Revealed within the middle of the excavation trench 7 was a late 15th century tile kiln placed within an earlier structure probably used as an open-ended forming shed for the manufacturing of the tiles. The tile kiln itself was constructed from re-used waste tiles from earlier kiln firings. The excavated part of the kiln comprised three furnace chambers and a horizontal flue placed to the rear of the kiln. After a number of firings, the kiln was rebuilt and this time included re-used 12th century Reigate stone capitals from Merton Priory. The tiles may have been manufactured for a rebuilding/repair phase of Merton Priory. Truncating the kiln were the chalk foundation walls for a small building measuring 7.20m wide (east to west). The southern, eastern and western extents of this building were located but it extended to the north, beyond the limits of excavation. During the middle of the 18th century this late medieval building was enlarged with the addition of extensions to each end of the building. Historically, this building is referred to as ‘Gate House’ and is mentioned in a number of detailed documentary references and photographs survive. The building stood until 1906 when it was finally pulled down and replaced with the Wimbledon and American Roller Skating Rink, afterwards by an airship and balloon factory. In 1922 it became the Wimbledon Palais de Danse. Excavations were carried out within three trenches located on either side of the River Wandle. Divers were also brought in to search the river for artefacts and structures. Within one trench, located to the north of the existing Grade 2 listed “Wheelhouse”, the walls of an earlier 18th-century print building were found. The southern wall of the building was found to be medieval in date and forms a monastic building associated with Merton Priory. Within the building, a number of brick features were recorded including a possible water wheel gear pit, drains and a stove. A floor surface of crushed chalk was revealed along the western wall of the building which contained two parallel grooves cut into the surface. These have been interpreted as tracks for the dye trolley which would have run along the length of the printing tables. Excavations on the west bank of the River Wandle revealed a number of posts and planks of weather-board from the printing sheds. Amongst the building rubble, a guide roller from a calico-printing machine was recovered. Finally, the Time Team recreated the lost art of hand block printing with the cutting of the print blocks, mixing of the dyes and the hand block printing of a length of silk. This took place inside the former Liberty’s print building now used as a craft market. The episode is available on YouTube.